1-1D McKinstry Bros Dromara 1647. 2-2D McKinstry Bros 1644, 3-3D Doonan & McGuinness Dromore 1636, 4-4D Doonan & McGuinness 1630, 5-5D Russell Bros Dromara 1628, 6-6D S G Briggs Lisburn & Dist 1622, 7-1C Bingham & Seaton Derriaghy 1621, 8-7D McKinstry Bros 1617, 9-2C M & T Griffith Eastway 1612, 10-1G S Ogle Drumnavaddy 1609, 11-8D P & J Boal Dromore 1605, 12-3C G & M Atcheson Ligoniel 1600, 13-2G W McDowell & Son Milltown 1596, 14-3G W McDowell & Son 1595, 15-4G R Williamson Newry & Dist 1594, 16-5G J Brush Banbridge Soc 1594, 17-9D O & M Monaghan Colin 1592, 18-10D L Magee & Son Lisburn & Dist 1591, 19-11D J Kelly & Sons Dromore 1591, 20-4C G McKenna Eastway 1591. Sect A 35/170 – J McCormick Cookstown 1537, K Shannon Dungannon 1525, W & J McLean Rasharkin 1515. Sect B 72/311 – B Swann & Son Kells & Dist 1555, Fleming Bros Crumlin 1541, Steele & McNeill Rasharkin 1540. Sect C 53/215 – Bingham & Seaton Derriaghy 1621, M & T Griffith Eastway 1612, G & M Atcheson Ligoniel 1600. Sect D 41/190 – McKinstry Bros Dromara 1647, McKinstry Bros 1644, Doonan & McGuinness Dromore 1636. Sect E 101/462 – A Craig Laurelvale 1565, A Craig 1564, G & P Lavery Hills & Maze 1563. 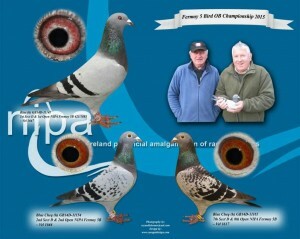 Sect F 26/108 – G & P Brown Corrigs 1576, P Lue & Son Downpatrick 1564, P Byrne & Son Downpatrick 1545. Sect G 44/211 – S Ogle Drumnavaddy 1609, W McDowell & Son Milltown 1596, W McDowell & Son 1595. Sect H 35/141 – R Witherow Limavady 1442, W McIlmoyle Limavady 1424, W McIlmoyle 1423. 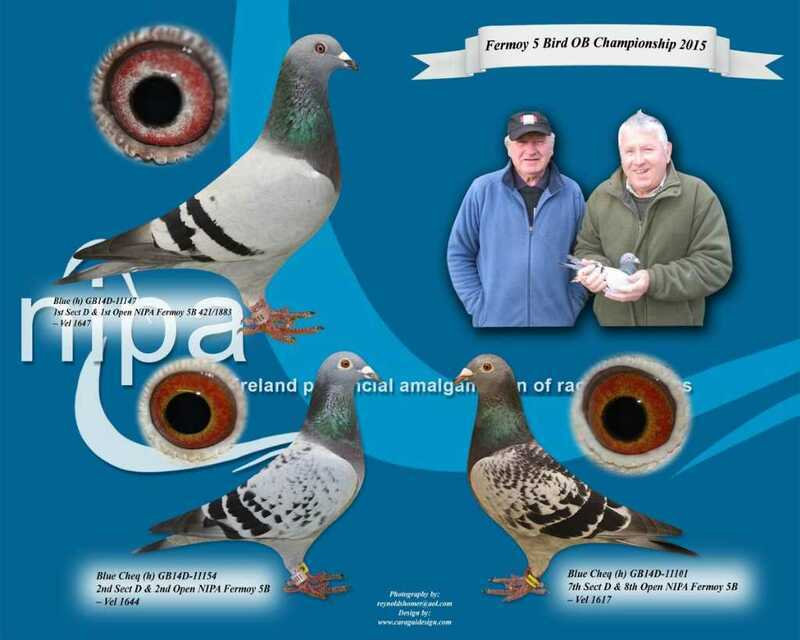 Killyleagh Centre Fermoy 5 Bird – G & P Brown Corrigs 1576, P Lue & Son Downpatrick 1564, P Byrne & Son Downpatrick 1545, McCartan & Woodsides Killyleagh & Dist 1542, McCartan & Woodsides 1542, J McClenaghan Ards 1535, Gordon Bros Killyleagh Cent 1534, H McAllister Killyleagh Cent 1530, J Quinn & Son Downpatrick 1530, C & G Adair Killyleagh & Dist 1529. 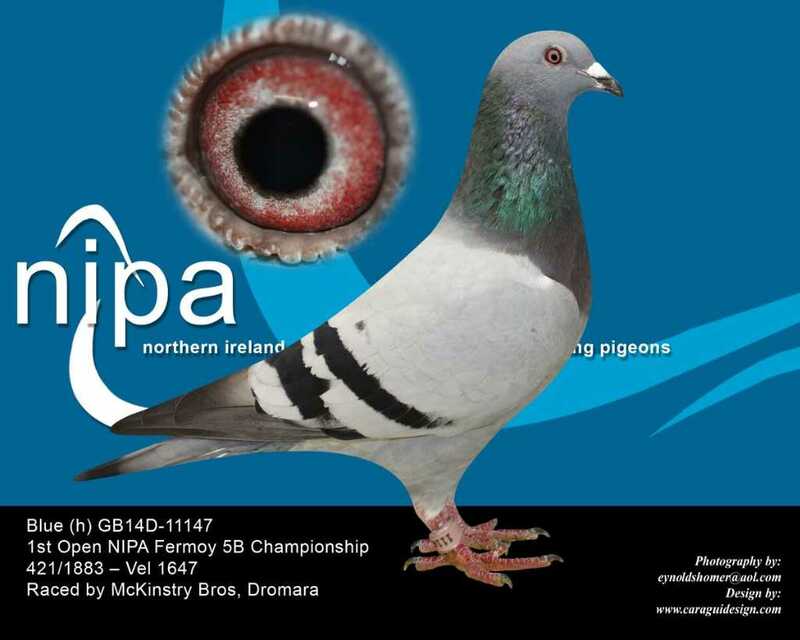 Cullybackey Centre Fermoy 5 Bird – B Swann & Son Kells 1555, Steele & McNeill Rasharkin 1540, Surgenor Bros Kells 1535, Scott & Clements Kells 1527, Scott & Clements 1522, L Mullan Harryville 1522, McFall & McManus Ballymena 1518, Steele & McNeill 1502, Russell Bros Cullybackey 1498, A Darragh Cullybackey 1496. Muckamore Centre Fermoy 5 Bird – J White Muckamore 1550, A & E Bell Muckamore 1547, Fleming Bros Crumlin 1541, A & E Bell 1533, J White 1532, A & E Bell 1516, McConville Bros Crumlin 1513, McConville Bros 1503, G Grant Crumlin 1489, Fleming Bros 1482. Coleraine Centre Fermoy 5 Bird – D & G McMullan Ballymoney 1519, J Connolly Ballymoney 1505, A & M Boyle Ballymoney 1476, J Connolly 1473, D Dixon Ballymoney 1466, D Dixon 1466, R & J Parke Windsor Soc 1454, W Blair Ballymoney 1451, S & C McCook Ballymoney 1446, D Dixon 1445. 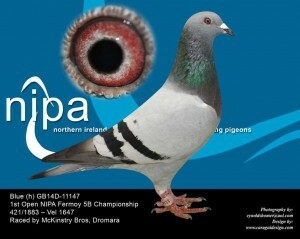 The N.I.P.A. have liberated in Fermoy at 11-30am,and the conditions were blue sky and sunshine with a brisk westerly breeze. In Dublin the wind is coming from 270 degrees ( westerly ) at 17 knots the cloud is few at 1800ft scattered at 2300ft and broken at 14,000ft the temperature is 18 degrees so good luck to all.